Even in water wonderlands like Washington state, conservation is important. As we learned from 2015’s drought, unusually low levels of snowpack are possible and some say might actually become more frequent. In places where droughts are more common and severe, farmers, as well as urban residents, are looking for ways to keep their properties thriving while being mindful of water usage. In Washington, we’re not yet to the point of having to replace our lawns with xeriscapes, but it’s a good idea to prepare a slight shift in that direction now. Knowing how to use water efficiently will help us avoid scrambling for solutions if the supply becomes short in the future. Sprinkler Maintenance – During the summer, some property owners invest in sprinkler systems. This is an efficient way to keep lawns hydrated, but there may still be a high potential for overwatering and leaks. Check your system for damage to the lines, leaks around couplings, or broken sprinkler heads before setting it on an automatic schedule. Also, make sure the spray patterns are spreading water over unnecessary areas like sidewalks or patios. Watering Frequency – The Northwest can get pretty dry during the summer despite periodic rain showers. So, during the dry season make sure that your grass isn’t getting more than 1 to 2 inches of water per week. This amount may vary depending on turf type, so call your local sod supplier for more information on how frequently to water your hydroseeded, sod, or overseeded lawn. Timing – As a general rule of water-saving, it’s best to water thoroughly and less often. This allows water to penetrate deeper through all root zones before it evaporates. It also helps grass tolerate drought better should you need to taper watering back even further. Watering is best to do early in the morning, before 6am or earlier to give the lawn maximum time to absorb the moisture before temperatures rise. Check the Weather – It might seem like a no-brainer, but you’d be surprised how many homeowners and businesses leave their sprinkler systems on before, after, or even during the rain. If there’s rain in the forecast, leave the watering to mother nature and let your sprinklers have a day off. Fresh Air – Remember that oxygen and nutrients are just as critical to turf grass as water. There’s no need for grass to constantly be wet, so scaling back the watering schedule slightly or aerating the grass will allow it to breathe. 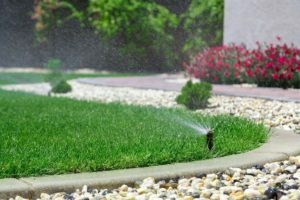 This is both beneficial to your lawn as well as the local water supply. Let it Grow – If the lawn is having trouble during heat and drought conditions, consider letting it grow a bit longer. Letting grass blades get a little taller has the added benefit of helping protect root systems from intense sunlight and heat. Rebates – Many utility companies offer generous rebates for home and business owners who install systems that limit water use. Low volume sprinkler heads are also available to help avoid overwatering and runoff.